Kristine Yen Sa is a Vietnamese poet/singer-song writer. Kristine Sa was born in Vietnam, Six years later, Sa and her family immigrated to Toronto, Canada. Since her debut in 2002, Kristine has released three full-length studio albums (I Never Knew, reBIRTH, and Hopeless Romantic), as well as AnimeToonz3, a Japanese-language anime remix project with DJ Jinnai and Jellybean Recordings. 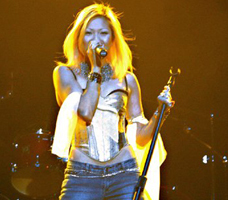 Kristine Sa's career took off with the release of her debut album, I Never Knew, in February of 2002, with sales reaching as far out as Taiwan, Australia, and the United Kingdom. Kristine continued her legacy with her second album, reBIRTH, in December of 2004; her anime project, AnimeToonz3: Kristine Sa (Lemon and Lime Editions) in November of 2005; and, finally, Hopeless Romantic in February of 2007. To this day, Kristine continues to pave the way for the new, unique brand of Pop music present in her three full-length studio albums and her Japanese-language anime remix project with DJ Jinnai and Jellybean Recordings. She has also did a voice over role in Suzuka, voicing Nana Shirikawa.